EZ ADD® Shop Dispenser I: This is a wall mounted unit designed to dispense additive into individual containers for splash blending. The Shop Dispenser performs the measuring and pouring portion of splash blending. 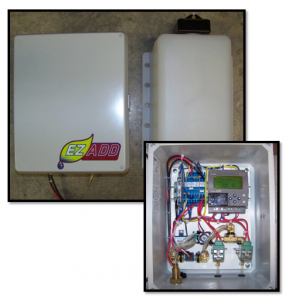 A keypad interface allows the user to select the amount of diesel fuel to be treated. b. Draw additive from a tote, drum, or other additive container. c. Adjustable additive ratio from 1:250 to 1:20,000.
d. Requires 120V AC power. 6’ power cord plugs into a standard wall receptacle. e. Option: Operate from 12V DC power. Allows unit to be installed on a fuel supply truck for dispensing on site. User supplied additive container will also have to be mounted to the fuel supply truck. EZ ADD® Shop Dispenser II: Same as the Shop Dispenser I with the addition of an additive injection fitting and tubing. 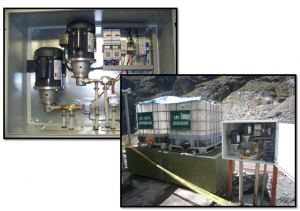 Allows the dispenser to be mounted near a bulk fuel tank inlet pipe and inject additive directly into the bulk tank inlet. The user types in the amount of fuel to be offloaded/treated into the keypad. Instead of dispensing additive into a separate container, additive is injected into the fuel inlet pipe. f. Option: Wireless connectivity for monitoring fuel and additive dispensed and additive level remaining. 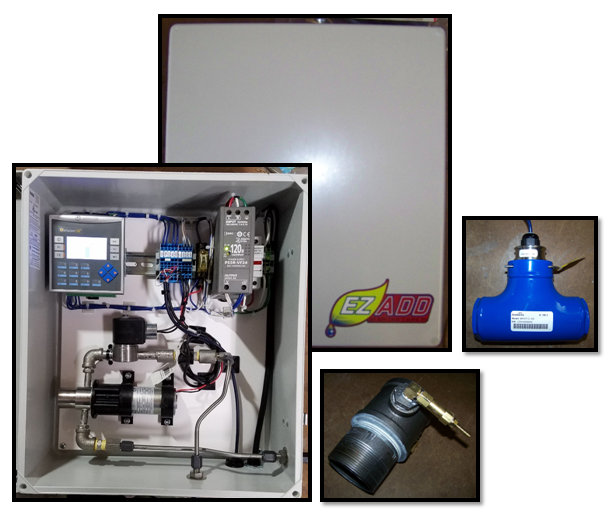 EZ ADD® Shop Dispenser III: Same as the Shop Dispenser II with the addition of a fuel flow meter. This dispenser is fully automated. Fuel flowing through the flow meter activates the system. Additive is dispensed real time into the bulk tank fuel inlet pipe through the injection fitting. No human interaction is required to operate the system. g. Option: Wireless connectivity for monitoring fuel and additive dispensed and additive level remaining. EZ ADD® Fuel Delivery Truck Dispenser: This dispenser is mounted onboard a fuel delivery truck to treat fuel as it is loaded into the truck or as it is offloaded from the truck. The user types in the number of fuel gallons to be treated and activates a switch to dispense additive. b. Draw additive from an 8 gallon welded aluminum reservoir. c. Adjustable additive ratio from 1:500 to 1:20,000.
d. Requires 12V battery power. e. Options: various input options are available along with multiple additive tank sizes. EZ ADD® Fleet Additive Metering Systems (FAMS): This unit is connected to existing fuel dispensers at a fleet fueling facility. Fuel flow from the fuel dispenser activates the additive dispenser where additive is dispensed into the fuel flow real time. The FAMS can treat fuel from one or two dispensers simultaneously. Fuel and additive data are logged for future use. a. Accuracy is +/-3% for each individual fueling event. Overall accuracy is +/-0.5%. b. Draw additive from a pail, drum, or tote. c. Adjustable additive ratio from : 1:250 to 1:10,000.
d. Requires 120V AC power. i. Wireless connectivity to monitor operation and retrieve data. ii. RFID technology to recognize authorized vehicles and drivers. iii. Secure web access subscriptions for ease of tracking and analyzing data. iv. Web pages configured to user specifications. 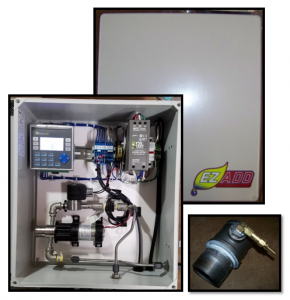 EZ ADD® Onboard Additive Metering System II (OAMS II): This unit is designed to be mounted onboard tractor trucks, straight trucks, dump trucks, etc. The OAMS determines the amount of fuel added to the tanks during refueling, calculates the amount of additive required, and dispenses the additive into the fuel tanks. The OAMS unit can treat one or two tanks. Installation is simple with typical hand tools. a. Accuracy is +/-5% to 8% and is dependent on user inputs during installation. b. Draw additive from an HDPE tank. Various sizes available. c. Adjustable additive ratio from 1:250 to 1:4000. Other ratios available up to 1:10,000.
d. Requires 10A 12V DC power. ii. Various additive tank sizes and enclosures can be designed to fit the user’s specific vehicles. EZ ADD® GenSet Dispenser: This unit is designed to dispense a set number of ounces of additive into the genset fuel tank on a timed basis to prevent the fuel from going bad. The user can adjust the number of ounces based on the size of the genset fuel tank and the additive mix ratio and can adjust the time (in days) between dispensing cycles. b. Draw additive from a separate customer defined tank. c. Adjustable additive quantity in ounces. Adjustable time interval between dispenses. d. Requires 10A 12V DC or 5A 24V DC power. e. Options: Can be powered by 15A 120VAC. EZ ADD® Onboard Yacht Dispenser: This unit is designed for installation onboard marine vessels. A fuel flow meter is installed inline of the bunker fuel line. 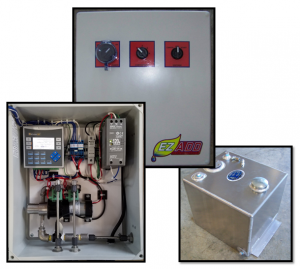 A separate controls box houses a dosing pump and associated electrical components. 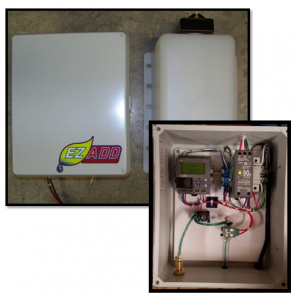 The dosing pump automatically matches its rate to the fuel flow. Additive is dispensed into the bunker fuel line. a. Accuracy is +/-2% with no calibration and +/-1% with field calibration. b. Draw additive from a customer supplied container. c. The additive dosing pump and fuel flow meter are sized to match the vessel. d. System can work off of 120VAC to 480VAC power. 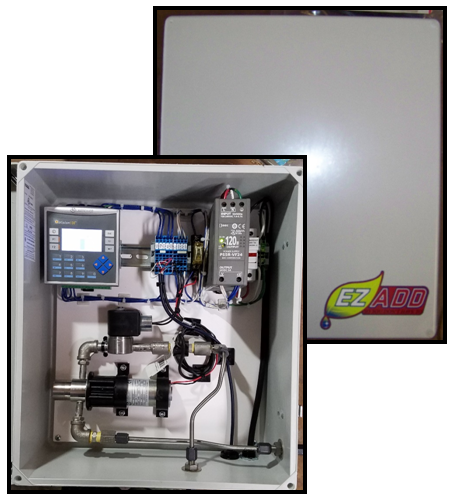 EZ ADD® Bulk Tank Dispenser: Our bulk tank dispenser is designed to treat fuel as it is off loaded from a delivery truck into a bulk tank at a large fleet fueling facility. 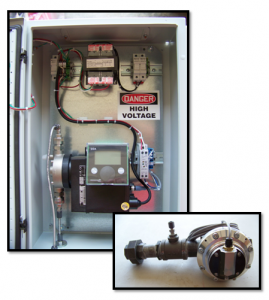 A flow meter is installed at the fuel delivery inlet or inline of the bulk tank supply line. 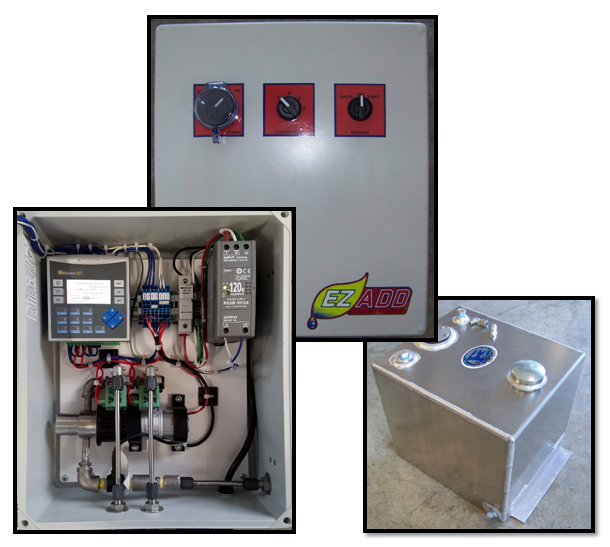 A separate controls box monitors the fuel flow rate and dispenses additive into the fuel stream. One or two additives can be dispensed simultaneously and at different ratios. The BTD can accommodate fuel flow rates of 60-400 gpm at 20-120 psi. The fuel flow and pressure are determined by the fuel delivery truck. a. Accuracy is +/-2% with no calibration. b. Draw additive from any size container including drums and totes. c. The additive ratio is adjustable from 1:500 to 1:20,000.
d. Fuel and additive data are logged for future use. e. System can be configured to accept 120VAC to 480VAC power at 50 or 60 hz. 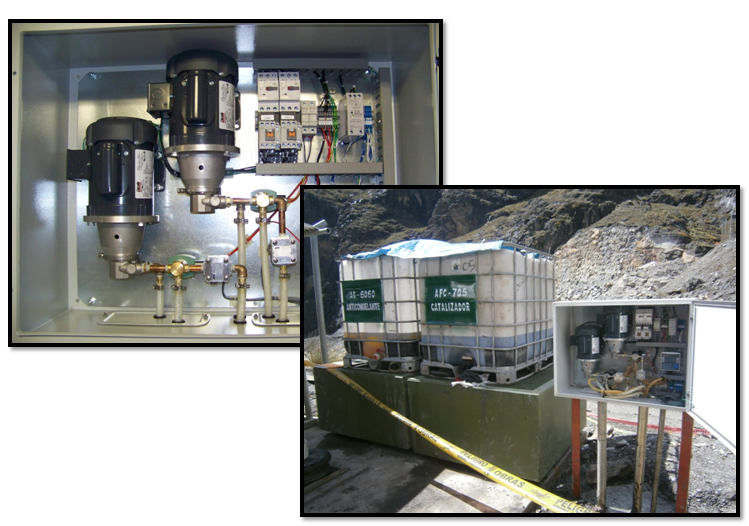 i. Heater system to maintain additive and controls area at acceptable temperatures in extreme cold environments. ii. Wireless connectivity to monitor operation and retrieve data. iii. RFID technology to recognize authorized vehicles and drivers. iv. Secure web access subscriptions for ease of tracking and analyzing data. v. Web pages configured to user specifications. EZ ADD® Custom: All our designs are modular and scalable. We can combine features from our various designs and scale them to meet your needs. Product descriptions and features are subject to change without notice.